The New Jersey Arts Annual (NJAA) is a unique series of exhibitions highlighting the works of visual artists and craftspeople in the state. Chosen for their excellence, these artists present works of drawing, photography, sculpture, painting, ceramics, glass, metal, wood and mixed media. Their works are compelling evidence of the outstanding talent residing in New Jersey. Fine Art and Craft exhibitions are presented in alternating years, and rotate among the major museums in the state. 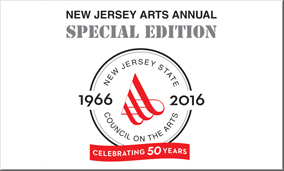 In 2017, to celebrate the 50th Anniversary of the New Jersey State Council on the Arts, a Special Edition exhibition will be presented by the New Jersey State Museum. Over its 50 year history, more than 1300 artists, craftspeople or folk arts apprentices have received grants from or participated in exhibitions sponsored by the State Arts Council. This exhibition will highlight some of those artists and the contribution of the State Arts Council to New Jersey’s visual arts community. The New Jersey Arts Annual series is sponsored by the New Jersey State Council on the Arts, and presented in a rotating partnership with the Montclair Art Museum, the Morris Museum, the Newark Museum, The Noyes Museum of Art of Stockton University and the New Jersey State Museum. This program is made possible in part by funds from the New Jersey State Council on the Arts, and with support of the New Jersey State Museum Foundation through the Lucille M. Paris Fund.